SEO PowerSuite is a comprehensive pack of 4 SEO tools, each dealing with a particular aspect of SEO. The package has all you need to get top search engine rankings and see your traffic and sales boost. Check out the step-by-step guide below to create an SEO campaign that&apos;s a smashing success — and a snap. Decide on the keywords you&apos;ll be building your SEO campaign around. Step 1: Get keyword ideas. Run Rank Tracker and follow the Wizard&apos;s instructions to create your first project. Switch to the Keyword Research module, and choose any of the keyword research methods to collect hundreds of great keyword ideas generated for you with the use of 20+ keyword research tools. Step 2: Pick keywords with most profit-generating potential. Look at your keywords&apos; KEI (Keyword Efficiency Index) to choose the most profitable keywords. The terms with a green KEI are frequently searched for and have pretty low competition. Simply put, these can bring you lots of visitors — while being comparatively easy to rank for. Run a ranking check to see where your website currently stands. Step 1: Select your target search engines and run the check. Press in Rank Tracker and choose your target search engines to see your website&apos;s current ranks for the selected keywords. Step 2: Identify keywords you need to focus on. Take a look at your current ranks — you may be ranking well for some terms already. Spot keywords your website doesn&apos;t rank high for, and concentrate your SEO efforts on those. Run a site audit to reveal errors and warnings that are holding your rankings back. Step 1: Scan your website. Run WebSite Auditor and enter your website&apos;s URL to start the analysis. Step 2: Find your site&apos;s weak spots. Take a close look at the factors with error and warning statuses. Study the Details section to see problem pages and get tips. Make sure you fix errors and deal with warnings accordingly to make your website search engine friendly. Create relevant, keyword-rich content using specific optimization tips. Step 1: Analyze your pages. Go to the Content Analysis module in WebSite Auditor, select the page you'll be optimizing, and enter your keywords. Let the software run a quick analysis of your page to get your page’s current optimization rate, details on keyword usage and other SEO stats. Pay attention to any factors with an Error or Warning status. Switch to the Competitors tab for details on how your top-ranking competitors are optimizing any given page element, and the Details tab to get specific, keyword- and page-targeted advice on how to improve your page's optimization. Step 2: Edit your page’s content. 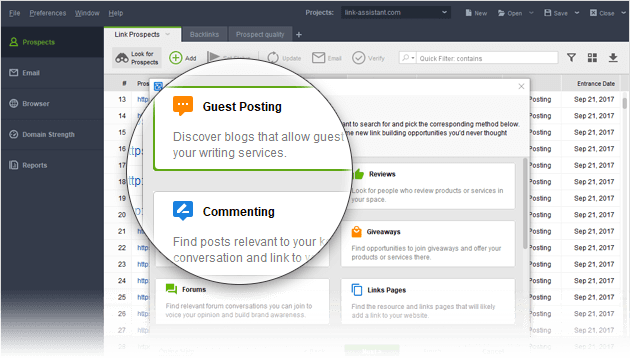 Switch to Content Analysis -> Content Editor for an editable live preview of your landing page. Look at the factors on the left, and make the necessary changes to your page’s content right in the right-hand view. Follow the tips you got at the previous step; the on-page stats and your optimization rate on the left will recalculate in real time, as you type. Once you’ve finished editing your page and reached the desired optimization score, hit Save page to save the newly optimized HTML to your hard drive, and upload it to your site to see your rankings (hence visits, hence sales, remember?) skyrocket. Examine your backlink profile and get rid of the links that are dragging your rankings down. Step 1: Evaluate your backlink profile. Run SEO SpyGlass and enter your website&apos;s URL to collect your backlinks. Go to the Link Penalty Risks tab, select your backlinks, and hit to see if some of them may be doing your website more harm than good. Take a closer look at links with a penalty risk over 40% and examine these pages to decide which of the links need to be removed. Step 2: Get rid of bad links. If possible, reach out to webmasters of sites spammy links come from, asking them to take the links down. If there&apos;s a large number of harmful backlinks in your profile, or if outreach proves ineffective, you can tell Google to ignore these links by disavowing them. To generate a disavow file in SEO SpyGlass, select the links you want to disavow, right-click them, and hit Disavow backlinks. Go to Preferences -> Disavow/Blacklist Backlinks to review your disavow file, and hit Export to save it on your computer when it&apos;s ready. Submit the file you created to Google Disavow Tool, and voila - Google will know which links to ingore when deciding on your website's authority. Expand your link profile with relevant, high quality backlinks. Step 1: Discover link prospects within competitors&apos; backlink profiles. Create projects in SEO SpyGlass for your best ranking competitors to see where they got their backlinks from. In a competitor&apos;s project, hit to analyze their backlinks&apos; quality. Pay attention to backlink authority factors like InLink Rank and Domain InLink Rank, Domain Age, Link Value, etc., and identify top link sources. Export your shortlisted links through File -> Export or by copying them to a spreadsheet. Run LinkAssistant and create a project for your site. Use the File ->Import option to load the link sources you&apos;ve exported from SEO SpyGlass. Step 2: Find more quality link prospects. In your LinkAssistant project, hit to find relevant link opportunities using LinkAssistant’s new-school prospect research methods. Select any method you’d like to use, and feel free to repeat the search for as many methods as you need. As it finds prospects, LinkAssistant will automatically fetch their email addresses so you can reach out to them instantly right from the app. Step 3: Reach out. 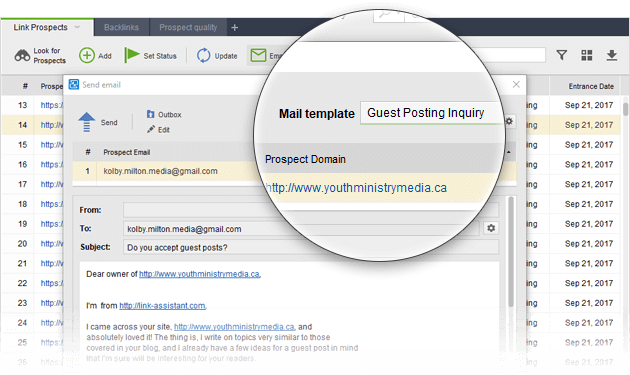 In your LinkAssistant project, click to contact potential partners and inquire if there are link opportunities available, such as guest posts, listings in quality business directories, or others. Make use of LinkAssistant’s ready-made email templates or create your own, completely custom ones.